Farm Supervisor Faces Charges Over Australia's Needles-In-Strawberries Scare Earlier this fall, needles were repeatedly found inside strawberries sold at grocery stores. Now a 50-year-old Berry Licious employee is being prosecuted and could face 10 years in jail if convicted. A strawberry is shown on a fork at a restaurant in Sydney in September. The tainting of supermarket strawberries with sewing needles prompted a scare across Australia; now, a farm supervisor is facing charges. A 50-year-old farm supervisor has been accused of intentionally planting needles in Australian strawberries, and could spend up to 10 years in prison if convicted. In September, the repeated discovery of needles stuck inside grocery store strawberries prompted widespread alarm, caused farmers to dump massive quantities and triggered a nationwide investigation. A spokeswoman for the Queensland Strawberry Growers Association told Australia's ABC broadcaster that police put more than 100 officers on the case. Intelligence agencies also assisted in the "complex investigation," local police say. Now, a woman named My Ut Trinh has been charged with seven counts of contaminating goods. Because the alleged crime was "aggravated," authorities say, the offense carries a possible 10-year prison term instead of the typical maximum of three years. The BBC reports that in total, 186 strawberries with needles were found across the country, including 15 hoaxes; it's not yet clear how many the accused woman was responsible for. One man was hospitalized after swallowing half of a needle. 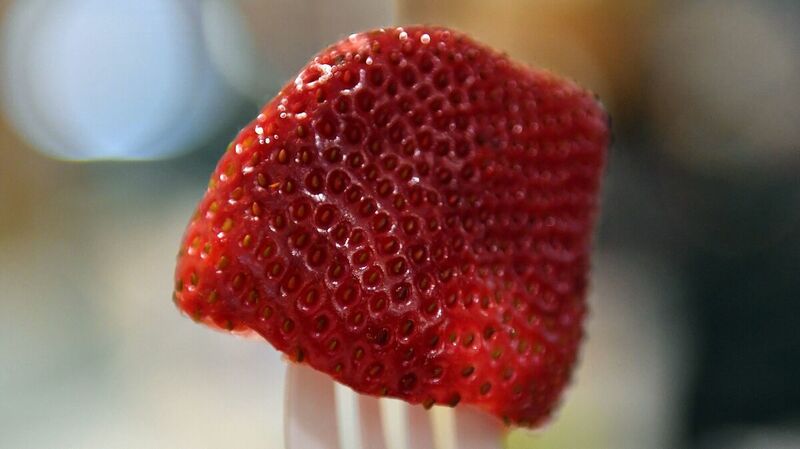 At least two children encountered needles in strawberries but were unharmed. My Ut Trinh is being held without bail. "Ms Trinh worked as a supervisor at the Berry Licious farm, but her lawyer said she did not work picking strawberries or in the packing sheds," ABC reports. "The court heard the woman was allegedly acting out of spite and that it was an act of sabotage." But Trinh's defense attorney argued that the prosecution had not described a specific motive for the contamination. The Queensland Strawberry Growers Association has welcomed the arrest, and called for the alleged strawberry saboteur to be "brought to account to the full extent of the law." But the group also noted that many reports of needles appear to have been copycats or false reports, and said that people making false claims to seek attention or financial reward should also face criminal charges. The needle crisis was financially damaging to the country's strawberry farmers. The industry urged consumers to ensure their safety by cutting up strawberries before eating them, rather than avoid buying them altogether. As ABC notes, some strawberry supporters and farmer fans started a social media campaign — #SmashAStrawb — to share recipes calling for sliced or smushed strawberries, which could be safely consumed.